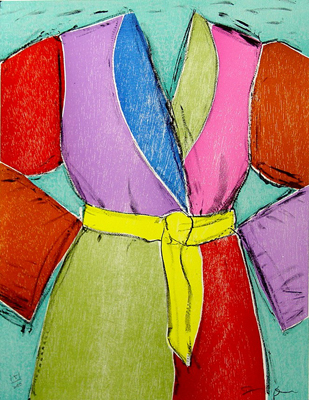 Artist Jim Dine is currently living in New York and London. In his paintings, drawings, sculptures, graphics, collages and assemblages he combined different techniques with handwritten texts and words and set real everyday objects against undefined backgrounds. The objects were both commonplace and personal, both poetic and ironic, reflecting his own feelings about life. 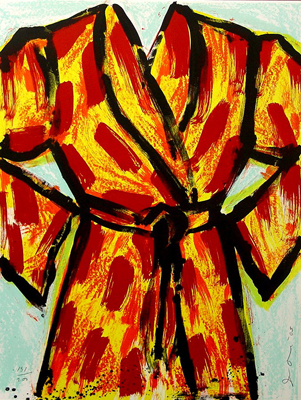 His constantly varied bathrobe, transparent to the gaze of the world, was a kind of metaphor for a self-portrait. In the 70s he turned to representational painting of a traditional kind. Original woodcut with lithography in 11 colors. Original lithograph in 6 colors. Born in 1935 at Cincinnati, Ohio. He studied at the University of Cincinnati and at the Boston School of Fine and Applied Arts in Boston, Massachusetts from 1953 to 1957. In 1957 he received a Bachelor of Fine Arts degree from the Ohio University, Athens. He moved to New York in 1959. He staged his first Happenings with Claes Oldenburg and Allan Kaprow at the Judson Gallery, New York. He had his first one-man exhibition at the Reuben Gallery, New York. He was represented at the Venice Biennale in 1964, and at the documenta "4" in Kassel in 1968.